There was colour and there was noise as much but it didn’t yield any goals. 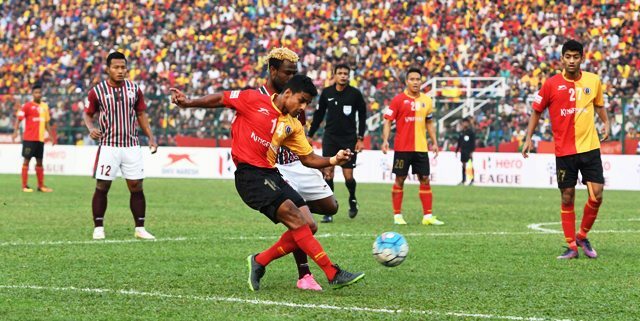 East Bengal and Mohun Bagan played a goalless draw in the Kolkata Derby in front of a full house at the Kanchenjunga Stadium in Siliguri on Sunday (February 12, 2017). Courtesy the result, East Bengal consolidated their position at the top of the table moving to 20 points from 8 matches while Mohun Bagan stay at the second spot moving to 17 points from 7 matches. The first chance of the match came in the 14th minute but East Bengal Goalkeeper TP Rehenesh adjudged the ‘Hero of the match’ dived to his left to thwart off Pritam Kotal’s deft push following a delectable Sony Norde cross. East Bengal had their first shy at the rival goal in the 23rd minute but Willis Deon Plaza following up a Robin Singh through pass couldn’t put it past Bagan Goalkeeper Debjit Mazumder who dived to his right to thwart it off. Mohun Bagan had their best chance in the 35th minute following a Sony corner. With the ball viciously dipping in at the last moment, Rehenesh managed to keep it off but with him out of position, Bagan’s Central defender Eduardo Ferreira failed to tap it in. Plaza was in the thick of things in the 41st minute when he spun the web past three but held on to the ball for a bit too long for it to be cleared by Eduardo. In the 43rd minute, Bagan Central defender Shoubhik Chakraborty got past a couple at the top of the East Bengal box but his effort was too weak to get past Rehenesh. Changing over and with the lights on, Nikhil Pujari’s persistence helped East Bengal earn the first corner in the 52nd minute but it didn’t yield any result. East Bengal could have taken the lead in the 57th minute but Debjit’s reflexes under the Bagan bar denied them. Plaza did all the right things – first by following up Robin Singh’s back header even as he shielded Eduardo over his shoulder, but his placement was fisted off by an acrobatic Debjit. It was perhaps the easiest chance of the match. East Bengal made their first substitution in the 68th minute – Haokip coming in for Robin Singh. In the 71st a lucky deflection landed Yusa Katsumi in a favourable position but Bukenya recovered fast to deny it for a corner, which eventually went abegging. Two minutes later, Darryl Duffy went on a solo run and earned another corner for Bagan, but this one too didn’t create any danger. Immediately after, Bagan coach Sanjoy Sen brought in his first change – Balwant Singh replacing Jeje Lalpekhlua and then the second substitution came in the 86th minute – this time Prabir Das replacing Sony. In the very next minute, Plaza after being found in the clear by a long ball from Lalrindika Ralte stayed guilty of holding on for too long enabling the Bagan defenders to close him down. In the injury time, off a counter attack, Bukenya managed to get a foot to Balwant’s intended pass to Duffy high otherwise, would have provided the latter with the easiest of the chance to tap in. But it stayed goalless.